Round 1: Good action to start the round. Meza-Clay pressed forward without taking a backward step. The southpaw Beltran circled to his right throwing his jab and putting combinations together. Round 2: Beltran tries to keep Meza-Clay off him. Beltran is having trouble finding his range because Meza-Clay keeps shortening the distance by throwing wild punches and getting inside. Both fighters exchange and land many punches at a fast pace. Round 3: Meza-Clay continues to make Beltran fight at a high pace. Meza-Clay is throwing wide punches and Beltran is trying to time him coming inside. Another close round, but Beltran is landing some clean shots. Round 4: Beltran trying to place his punches more carefully than Meza-Clay. Toe-to-toe action with Meza-Clay trying to impose his will. Both fighters landed good punches; Meza-Clay landed some hard ones. Round 5: Meza-Clay continued pressing forward, but at a slower pace. He tried to box a little. Beltran landed the cleaner and more effective shots this round and his jab was bothering Meza-Clay. Round 6: Meza-Clay landed many punches in the first minute. Beltran tried to keep him off with the jab. Beltran controls the 2nd half of the round. Beltran slowed him down by landing multiple shots. Round 7: Beltran is utilizing his jab more and it is enabling him to land more punches than Meza-Clay. Meza-Clay is throwing his punches wide and out of range. Round 8: Meza-Clay continues to walk in throwing his shots. Beltran keeps boxing and tries to land his combinations when Meza-Clay is in range. Rounds 9-12: Beltran's punches are wearing down Meza-Clay. Beltran is landing clean shots and Meza-Clay looks sluggish. The 12th round displayed fast paced action as the early rounds did. Beltran weathered the storm of Meza-Clay's finale of shots. Meza-Clay was trying real hard, but Beltran possessed more energy in these later rounds and finished strong. Overall Summary: The work rate of Fernando Beltran Jr. proved to be too much for Monty Meza-Clay in this featherweight fight. Beltran threw more than 100 punches per round en route to his 12 round unanimous decision victory. Beltran scored with mostly his right jab and straight lefts. 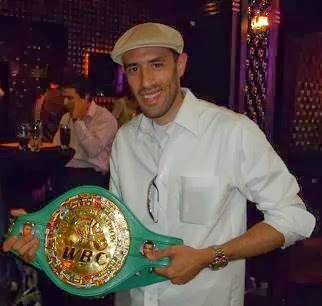 Meza-Clay landed some good shots in the fight, but never seriously hurt Beltran. Fernando Beltran Jr. improves his record to 33-3-1, 18 KO's. He has won 6 of his last 7 fights. Monty Meza-Clay's record falls to 28-3, 19 KO's. He has lost his last 2 fights after winning 8 straight.